Home » Book » Rebuild or walk away? The older you get the harder it is to maintain friendships. Life ebbs and flows, friends move away, and people move on to other circles. Moving this last year and additional health issues caused me to be in a funk. I wondered if this was my new reality or something else was happening. Part of my issue was thyroid cancer and thank goodness it’s gone! The cancer was causing exhaustion and a low-level depression while wreaking emotional havoc on my body. During this time a good friend of mine stopped being friendly. As we met to talk through our issues, it became clear this person had chosen to walk away during this time. It hurt when the things they mentioned were brought on by the cancer and could have been worked through had I known sooner. This got me pondering about what to do when someone you like or love walks away. What do you do? Figure out if it’s worth working through. This is a hard one to process. You need to take time to make sure both of the people in the relationship want to be friends. Working through boundaries on which life topics are safe can help move the relationship forward. My friend and I had to do the hard work of figuring out what we could and couldn’t talk about in order to continue the friendship. That’s never an easy conversation to have, but a necessary one. Some would think, ‘Well, is this truly a friend?’ But the answer can be yes. These types of conversations need to happen in order to be a better person and friend. This keeps coming up for me personally. If someone won’t hang out, text you back or call you, then stop bothering them. Time is so precious to everyone. You can’t get time back, so why waste it with people who don’t want to spend it with you? Find the people that love you for you and move on. Find out why they walked away (if you can). Sometimes it’s best to let people walk away. There is a reason why they have left the friendship and that’s okay. If they are willing to talk, ask them what you did to cause the conflict. It can be something as little as ‘you hurt me when you said this’. Or maybe they need space to figure out life situations. Whatever it is, the following quote helps me navigate hard relationship decisions. Henry Cloud uses this illustration in his book, Necessary Endings to explain that if some relationships don’t end, your life cannot flourish. He writes, “Without the ability to end things, people stay stuck, never becoming who they were meant to be, never accomplishing all that their talents and abilities should afford them”. Rebuilding takes time and should be done with intention. Reaching out and setting up coffee dates, etc. can be a time to reconnect. However, the re-connection needs to done on both sides for it to work. Rebuilding can take months as you navigate the new normal. In being intentional ask yourself, ‘Does this person still build me up and are we good influences in each others’ lives?’ Keeping these types of questions top-of-mind can help you figure out how to rebuild. This is up to you and your friend. I love the picture quote above. As friends, we should clap loudest when someone has good news. 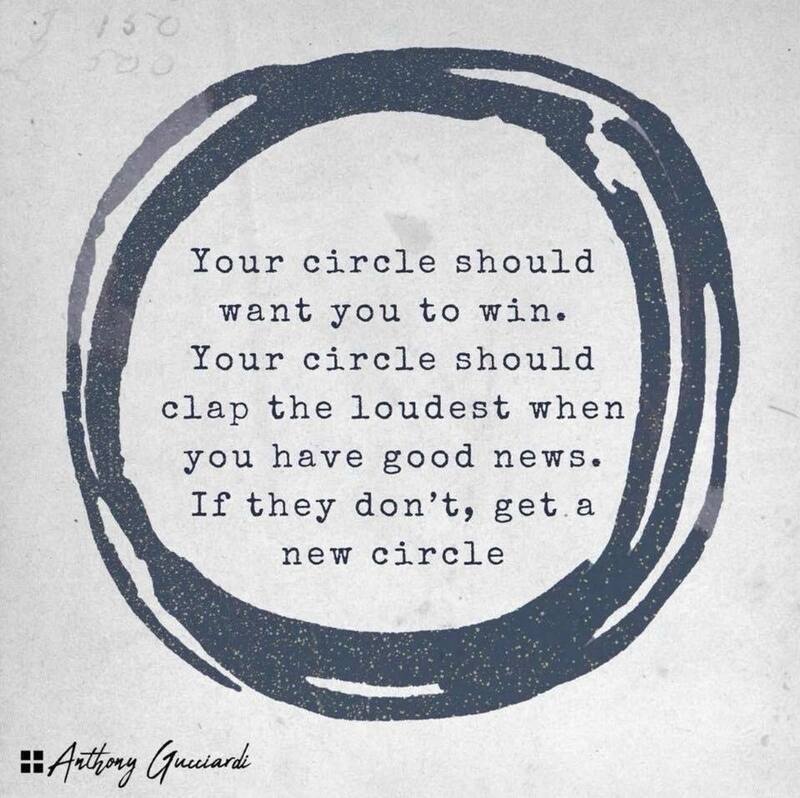 Your circle or core group of friends should want you to win at all aspects of life. If they don’t, it’s time to get a new circle. Our loudest cheerleaders need to be the circle of friends in your life. This friend and I worked everything out for the better. She says now I’m someone who listens when something is off and allows others to speak into my life. Our friendship has grown as a result of all this hard work. One of my life themes this last year has been how to be a better friend who loves well. There are many components to that statement, but God has made it abundantly clear who to keep in my life and how to love those people well. While a very lonely season, there is always a reason behind these rebuilding times. God wants you to surround yourself with those who lift you up, help you flourish and move you forward. Sometimes that means stepping away and letting go. Other times it means making it work. Whatever friendship season you are in, know that He always wants what is best for you and your friends.